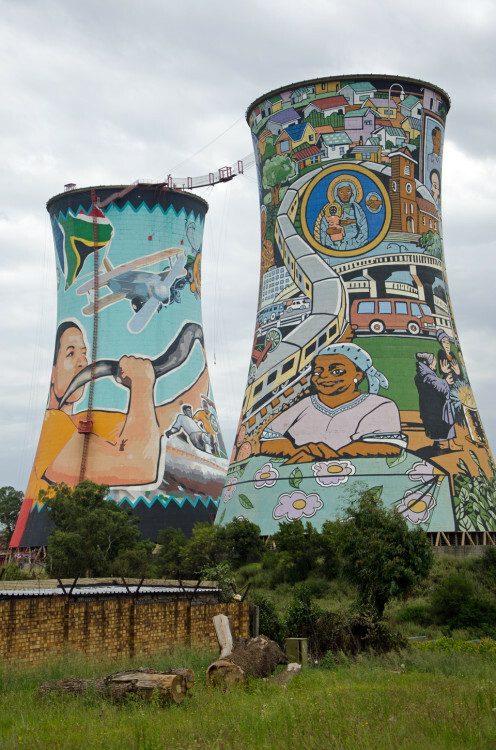 Exploring Soweto for the finest street and traditional foods, in the company of local creatives I See a Different You, Ishay Govender-Ypma gets a taste for Johannesburg. Unless you are a frequent visitor to Soweto, the South Western Townships, there are many media-drilled notions you may have of the area, most of them relating to danger and violence. The last thing you may expect is a relaxed domesticity in parts and areas so vibrant, that they pulse with life, creativity and wealth through the day and late into the night. 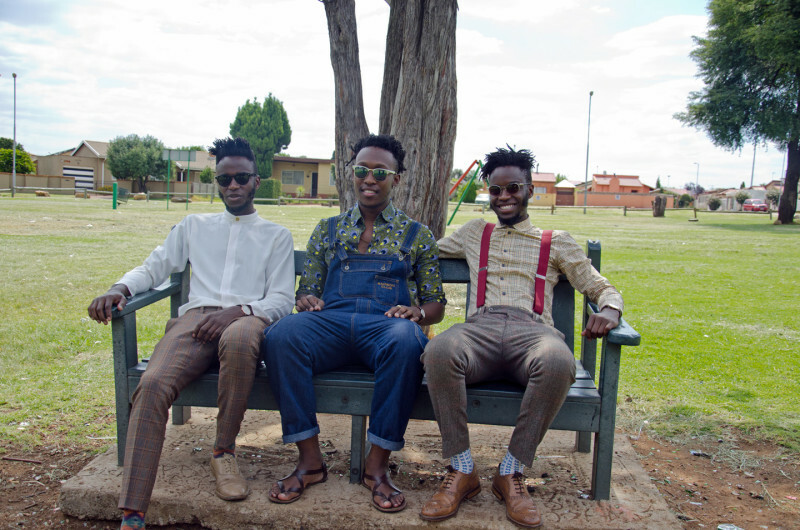 Sitting on a park bench in Pimville, Soweto, the trio from I See a Different You (ISADY), light up when we speak about Johannesburg township food. Twin brothers Innocent and Justice Mukheli and their good friend Vuyo Mpantsha are well known as young, sought-after art directors in the advertising industry. 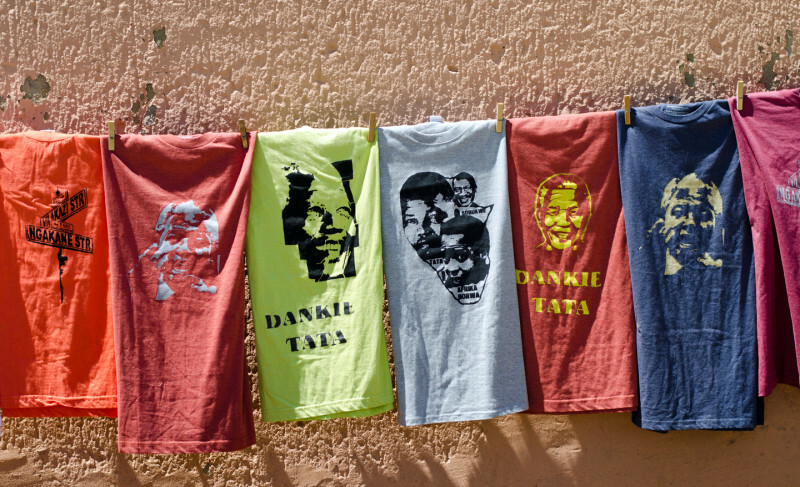 They’ve also built a reputation for the stylised portraits they take in and around Soweto for their passion project ISADY. By sharing the world they grew up in with honesty, not blurring out the dilapidated buildings or barren fields, they bring the focus onto them, and invariably, onto people like us, going about our lives in Africa, making the best of it. Their talent has taken them as far afield as Japan on a Diesel collaboration showcasing their work. They have been in the front of the camera as fashion models and behind it, directing other models, photographing President Jacob Zuma and filming a documentary about a local township boxer most recently. They all grin widely when I tell them that I wasn’t convinced that such slim, image-conscious lads would be very interested in chatting to me about food. And lots of it. “We love food. It’s a favourite pastime,” says Innocent, as they describe in detail their latest obsession with a hip restaurant in Melville, an upmarket suburb in Johannesburg. I soon learn that they finish each other’s sentences without hesitation and speak with an ease of friends who know each other very well. On the topic of favourite township foods, Justice mentions 7-colour rice, a popular dish made with the addition of several ingredients, mainly vegetables that lend it the name. “Township food is daring, it’s detailed and it’s made with love,” says Justice, as they regale me with stories about the meals their mothers still prepare for them on weekends. Soon there are desperate declarations of hunger. We leave the park while children play on swings and slides, and walk up the road and through the open gate of a small, unnumbered house. 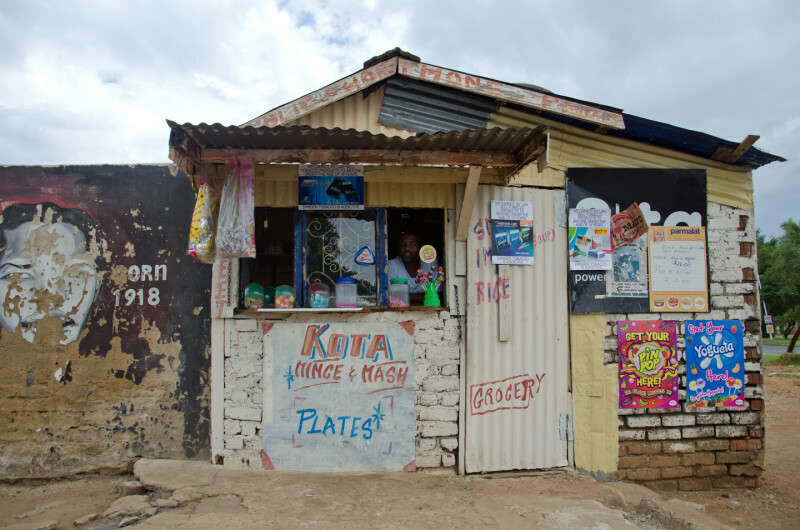 There is no signage in the front, but at the back there is a board outside a shed listing a large variety of kota made to order. 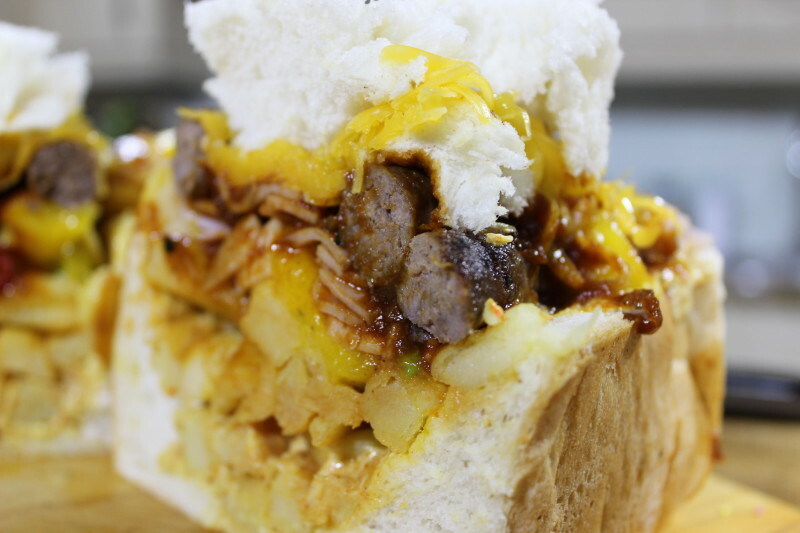 A kota is very similar to bunny chow, a hollowed out quarter or half loaf of white bread and it’s filled with inexpensive ingredients such as pink polony, fish fingers, chicken viennas, eggs, cheese, and all are served with chips. The chips are of the slap or limp variety, favoured by South Africans across the country. A man stands behind the open window of the shed, frying chips in a deep fryer and another sitting on a white chair greets us with a nod, a beer in his hand. When the kota are ready and packed individually into plastic bags, we grab our haul and drive to the nearby Shoprite centre. Innocent buys cool drinks while we sit on awning-covered benches, munching. 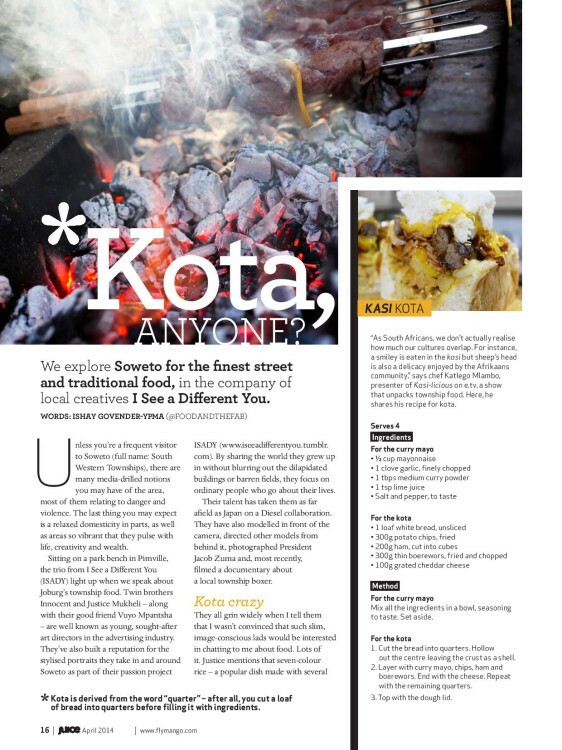 “Think of the kota as an evolving township street food burger,” says Vuyo. 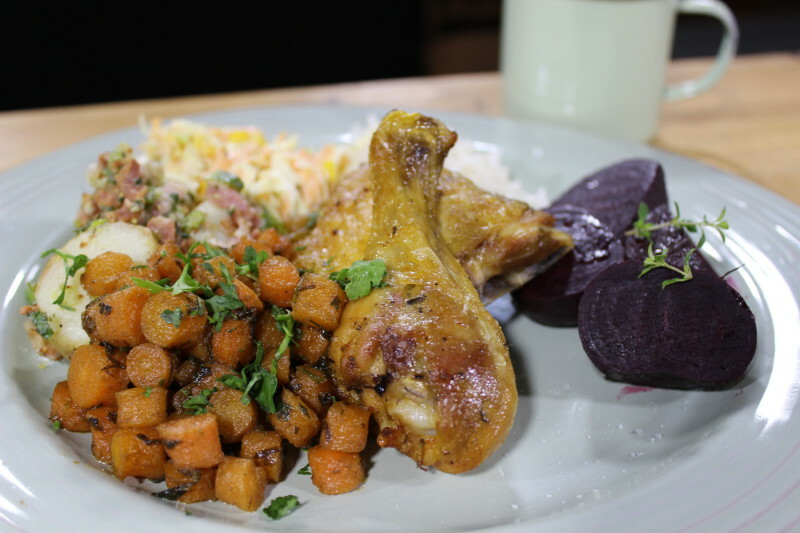 Popular fillings around Johannesburg include mince and mash and fish and chips, available at roadside spazas and backyard eateries like the one we visited. We watch a couple in the parking lot grilling marinated steaks and boerewors over a coal braai for customers. 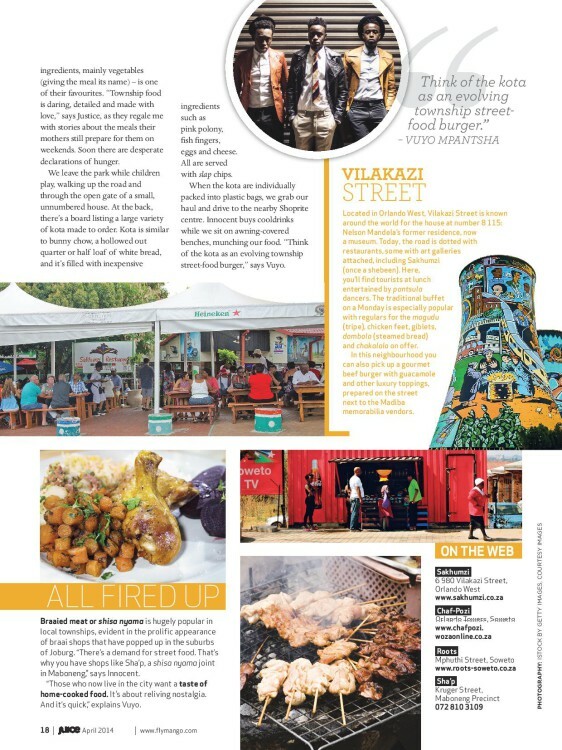 Braaied meat or shisa nyama is hugely popular in the townships across the country, and it’s no more evident than in the prolific appearance of braai shops that have popped up in the suburbs of Johannesburg, both downtown and in the newly invigorated areas. “There is a demand for township street food. That’s why you have shops like Sha’p, a shisa nyma joint in Maboneng” says Innocent. 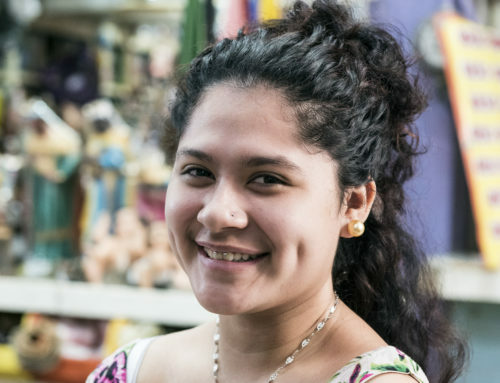 “Lots of people like myself who now live in the city, want a taste of home-cooked food. It’s about reliving nostalgia. And it’s quick,” explains Vuyo. I have to admit defeat; I eat the fried egg and some of the chips, but can’t manage to get far with the soft, spongy bread of my kota. I make a mental note to take up the challenge another day. Later that evening, the trio and I go our separate ways. I return to Vilikazi Street, in Orlando West, known around the world for the house at number 8115, Nelson Mandela’s former residence, now turned into a museum. Today, it’s dotted with restaurants, some very modern with art galleries attached, and customers of all colours and backgrounds clamour to get a street-facing seat. There may be no mountain view, but the constant parade of luxury vehicles has become a spectator sport. In this neighbourhood you can also pick up a gourmet beef burger, with guacamole and other luxury toppings, prepared on the street next to the Madiba memorabilia vendors. At Sakhumzi restaurant, which was once a shebeen, you will find tourists at lunch entertained by pantsula dancers, and locals in the evening, making merry late into the night. The traditional buffet on a Monday is especially popular with regulars for the mogudu (tripe), chicken feet, giblets, dombolo (steamed bread) and chakalala. 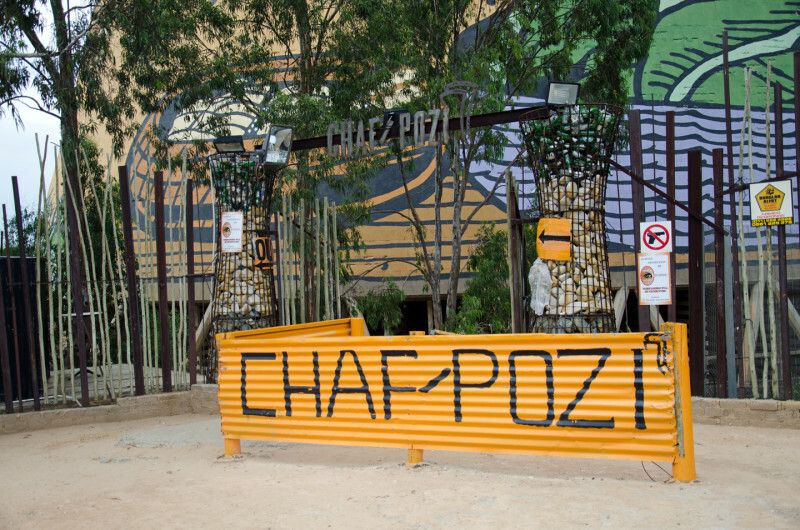 I order a second helping of samp and beans (it’s just that good) with my braaied ribs, and plot my meals at Chaf Pozi, located at the foot of the mammoth Orlando Towers, Roots, and the next taxi rank I see. That’s where the really good street food is, the ISADY lads tell me. Mix all the ingredients in a bowl. Season with salt and pepper. Set aside. Cut the bread into quarters, and hollow out the centre by neatly cutting out dough and leaving a crust shell. Layer with curry mayo, chips, ham, chips, boerewors and end with the cheese. Repeat for the three quarters left. Top with the remaining dough lid.